What It’s About: Dr. Pretorius (Ernest Thesiger) arrives on Henry Frankenstein’s (Colin Clive) wedding night. Pretorius was one of Henry’s instructors at University, and he has a devil’s bargain for Henry. Like Henry, Pertorius created life, growing it “as nature does” rather than reanimating corpses, but he cannot make a full-sized creature. Pretorius suggests the pair collaborate and make a mate for Henry’s monster (Boris Karloff), but Henry refuses. The monster is roaming about the countryside, murdering occasionally, pursued constantly, until he’s discovered by Pretorius. Pretorius befriends the monster, after a fashion, and gives him a taste for wine. Pretorius uses the monster to abduct Henry’s wife Elizabeth (Valerie Hobson) and forces Henry to help him create a Bride (Elsa Lanchester) for the monster…..
Why Watch it Today? : Character actress Elsa Lanchester was born today in 1902. 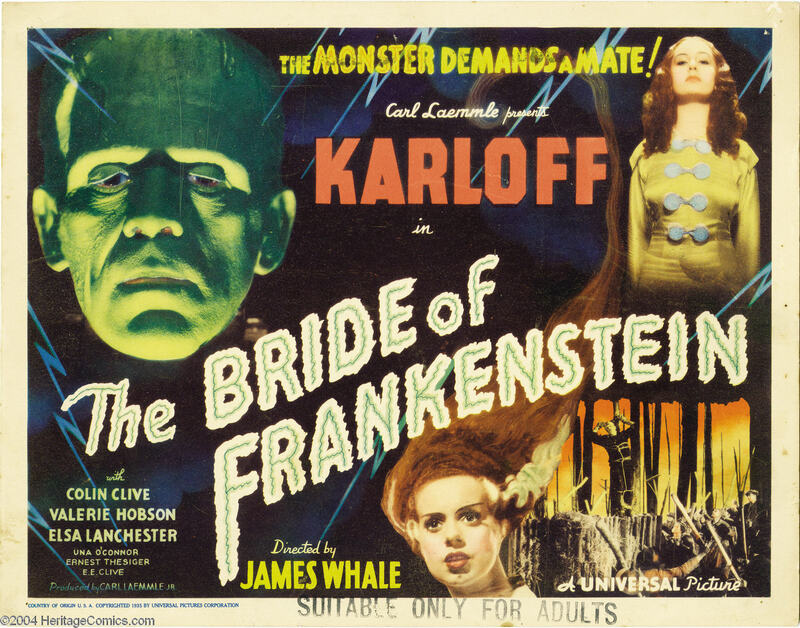 Lanchester would later specialize in comic roles, but here she creates the memorable Bride, every bit as iconic as Karloff’s Frankenstein (both, admittedly, were assisted by director James Whale and celebrated make-up artist Jack P. Pierce). While Bride of Frankenstein suffers from perhaps too much comic relief (Una O’Connor, I’m looking at you) and was parodied too well by Mel Brooks in Young Frankenstein (the scene where the monster meets a hermit is impossible to watch without laughing if you’ve seen Gene Hackman and Peter Boyle in the same situation) to function as the horror film it was known as for years, it features plenty of atmosphere, perfect for the season, and plenty of subtext worth paying attention to. This entry was posted in Adaptation, Based on a Book, Black and White, Black Comedy, Camp, Horror, Mad Scientist, Monster, Movie of the Day, Sequel and tagged before they were famous, Best Sound Nominee, Billy Barty, Carl Laemmle Jr., Colin Clive, Dwight Frye, Elsa Lanchester, Ernest Thesiger, Frankenstein, Frankenstein's Monster, Franz Waxman, grave robbing, graveyard, hermit, interrupted wedding, James Whale, John Carradine, John L. Balderston, Mary Shelley, Odious Comic Relief, scientists, Una O'Connor, Universal Pictures, Walter Brennan, wedding, wedding night.